We are proud to be associated with Emsisoft and to be an authorized reseller for them. One of the best things about working with Emsisoft, is working with people like Daviat and the rest of the Emsisoft team. Not only is Emsisoft Anti-Malware a top-of-the-line antivirus and Anti-Malware program, the support provided by the Emsisoft team is unsurpassed. Recently Daviat, knowing that we and many of our subscribers are older folks, passed this article along to us and asked us if we’d like to share it with you. It’s a really good article. It first appeared on the Emsisoft Blog and was written by freelance writer, Vincent, from New Zealand. Albert’s story is backed by statistics. In the USA, only 59% of people over the age of 65 use the Internet daily, as opposed to 86% of all adults under 65. There is good news for those of us online: The number of elderly going online is increasing every year. 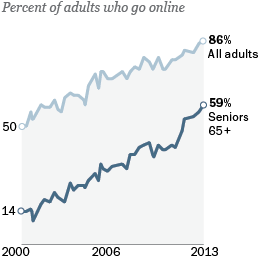 The world continues to see a rise in seniors accessing the Internet. Many countries now have active Government and non-profit programmes that teach older people how to use the Internet. Those that don’t have those services often have access to enthusiastic children or grandchildren who hopefully have the patience to teach their elders to use a computer or tablet. Especially for the elderly, the internet can be a way of accessing not only information but a way of keeping in touch with friends and family that might not have otherwise been physically possible. 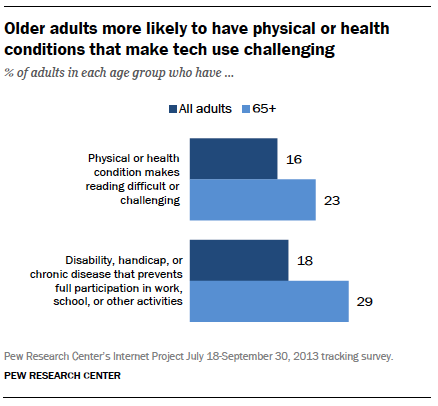 Many seniors admit they have difficulty using the internet due to a disability. Poor eyesight is commonly cited. According to research on Pewinternet, two out of five American seniors have a “physical or health condition that makes reading difficult or challenging”. At least poor eyesight is becoming less of an excuse to avoid going online. Nowadays, there are some great reading solutions online, such as text reading software and text enlarging software that magnifies text. In fact, text magnification is now a built-in feature on most modern computer browsers and operating systems. Albert doesn’t have this problem – he has a great pair of glasses and a large tablet with pinch-to-zoom. So no excuses there. For most of us digital natives, access to the Internet feels like a fundamental right, such as access to fresh water or sanitation. The UN has declared internet access to be a human right. However, many seniors who have never used the internet might not see what all the fuss is about. It’s hard to describe the benefits of social media to someone who has difficulty switching a computer on. Simply using email or browsing news would be a great start for people like Albert. Rather predictably, not even half (48%) of non-Internet-users believe they are missing out. Amongst regular senior internet users, the majority (79%) agree that their offline counterparts are missing out on information. Clearly, once Seniors join the online world, online technology becomes an integral part of their lives, making it easier to interact socially, run daily tasks such as finding a plumber or paying bills online. The internet rapidly becomes a part of daily life for many seniors embracing its’ convenience. Like many people, Alberts friends and family is spread out all over the world. Like many seniors, he finds it challenging to socialise in person, especially as he no longer drives a car. This seriously affects his ability to participate in social activities. According to Pewinternet research, some 81% of seniors that use social media socialise with others on a daily basis. Whereas only 63% of seniors that don’t use social media socialise with others daily. Those using social media get out socially more often! It appears that social media offers an additional ‘venue’ to socialise, and perhaps indeed, to plan in-person meetings and social events. Seniors who use social networking sites such as Facebook to socialise online are more likely to regularly socialize with friends, whether online, in person, or over the telephone, compared with seniors who are not social networking site users. Ironically, becoming active on social media sites leads to more social interaction – not social isolation. Given that Albert struggles with loneliness and isolation, social media might just be part of the solution. Albert has heard about the many threats there are online, and as we can attest at Emsisoft, there are some very real threats online. No-one is immune to these threats. Unfortunately, some online criminals target seniors for their lack of skills online and use this to exploit their advantage. Albert might do well to heed some practical advice from the MSICS in the USA, which can help senior citizens avoid getting caught out by online threats. Cloudeight has been committed to keeping seniors safe for 20 years and it’s our ongoing mission to keep as many people as we can from falling victim to the dark side of the the Internet. Thanks so much to Daviat and the Emsisoft team for the great work you do and for sharing this article so we could share it with our readers. Always remember, the more you learn, the safer you will be. Emsisoft Anti-Malware is easy to use, provide the best protection against the worst the Internet has to offer, and it won’t slow down your PC. We offer Emsisoft with Cloudeight installation at very special prices. Check out all our Emsisoft offers here. After more than seven years assisting seniors’ to learn how to use a computer, including my 80 year mother-in-law and her friend, most of the general ‘teaching’ is wrong. Assisting them to learn is more appropriate. Lessons in a class are not very successful as most of the ‘lecture in operation’ is mostly forgotten when the people leave the class because slowly, one-on-one with their own computers works well. Instructions with a step-by-step diagram on on subject at a time, kept with them in a folder or binder works wonders, along with contact by telephone for questions also gives confidence to the seniors’. My assistance is free, at times there is a small ‘thank you’ reward offered and most times is refused. Instructions with a step-by-step diagram on one subject at a time, kept with them in a folder or binder works wonders, along with contact by telephone for questions also gives confidence to the seniors. You provide a wonderful service to us “older users”, and i just want to say “Thanks”! I totally agree about the wonderful knowledge Cloudeight provides with giving us daily tips, also with the weekly Newsletter, and their Direct Care Service for the times we desperately need their computer help. I feel so much better knowing they are there to help and also agree about the Emsisoft Anti-Malware program. If you ever have a question about the anti malware, just email them, and they respond very quickly and are very courteous. I feel much safer online using this antivirus program.